MASKerade: FFC24 - Silver and Gold! FFC24 - Silver and Gold! Lots of silver and gold with a couple of red touches! I chose to focus on that one clear glass ornament with the gold snowflake on it. Making this card is so, so easy, but I think that the acetate window gives it a wow factor. The trickiest bit is cutting the circle window in the same spot in the silver panel and the white cardbase. But I just laid the silver on top of the white and ran it all through the cuttlebug at the same time. It didn't cut through the white, but it did leave a big impression where I could place the circle nestability after I had taken the silver panel out of the sandwich. And it left that embossed 'frame' on the silver panel for a little extra texture! I then simply taped some acetate in the window, die cut the Simon Says Stamp snowflake from SU! 's new Gold Foil paper (backed with Scor tape so that the snowflake became a sticker) and placed it in the window. The 3 little 'nail heads' at the bottom are some of the circle cut outs from the snowflake - they were too perfect not to use! As for the inside, I dithered (that's a mom word for sure!) whether to stamp the sentiment so that it could be partially seen through the window or not. In the end I stamped a Creatiate 'Merry Christmas' in Cherry - here's how it looks. 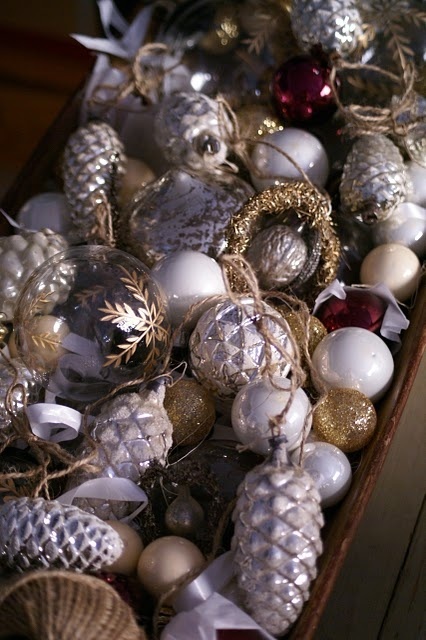 Although maybe you could argue that it mimics the cluttered, layered look of the ornaments in the box, I think I prefer it without the sentiment! I'd love to hear what you think! And we'd love to see you link up - the deadline is Wednesday Feb 12. This card is Wow factor. I totally love it. I also agree with you and prefer it without the sentiment. That way the snowflake really shines! But that's not to say that the other one is terrible - both cards are gorgeous! Simply brilliant. Gold and silver with acetate-who knew they would be so stunning together? Absolutely gorgeous card, Ardyth! You never cease to amaze me with your talent! Really stunning Ardyth! It took my breath away and I like the impression on the frame and the little gold dots you placed so perfectly. I agree with you on the sentiment. I think it looks more elegant without it placed within the acetate circle. This card literally took my breath away! IT IS STUNNING!!! I'm so seriously in awe of your creativity! The acetate window with the gorgeous die cut and the fabulous shade of blue shimmer paper seen to create a mystical feel to your card. ... and those three wee dots that didn't make it to the garbage bin...um....perfect!!! Stunning! Love the snowflake. Those nailheads are perfect! That is one gorgeous gold snowflake. I think it would show better without the sentiment behind it. O so chic. What a beauty! CAS at it's best. Great design and beautiful card. I love that such a simple card can pack such a punch. This is gorgeous and I love the little "nail heads" at the bottom! So very pretty! I love the metallic look! Thank you for leaving a comment on my blog! How was someone like you, not on my radar?! You were so kind to leave me a comment, because my tag likely put your eyes out. (It's even over the top for me, but I love to experiment.) For your card, I would have loved to see it head on and closed, with the sentiment through the window. That's an intriguing technique, but I can't image how the lines of the snowflake work with the lines in the text. (Does the deep red keep the gold from mingling?) I'm also amazed that the gold paper tolerated the thin die lines so well, and that you were able to get the paper out of the die without lots of folds being introduced. Thanks again for leaving a comment. I'm just thrilled to have found you.